Chancellor Angela Merkel’s government is pushing the idea as a way of avoiding punitive tariffs which are due to come into force on steel and aluminium imports on May 1 following an announcement by US President , following his announcement of tough new duties on steel and aluminium earlier this year. With time almost up, the chances are the tariffs will come into force – Mrs Merkel and French President Emmanuel Macron both visited the White House last week, but failed to change Mr Trump’s mind on the subject. However, the German government has now come up with an idea of how the conflict could be resolved amicably by the US and the EU negotiating a significant reduction in the remaining industrial tariffs on a broad front. Proponents hope to sell the plan to Mr Trump by stressing that it would allow him to tout it as a success which would offer improved export opportunities for a variety of US products at home. Despite scepticism from some within the steel and aluminium industries, economists have praise the German government’s push unanimously. 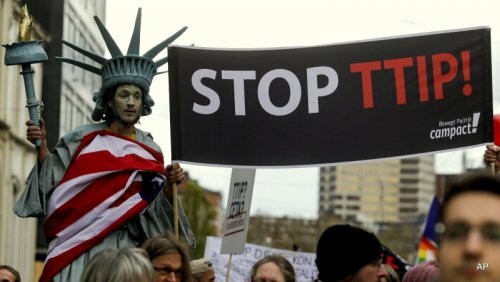 The proposed tariff agreement would be a stripped-down version of the controversial transatlantic free trade agreement TTIP, or TTIP-light, as it is being referred. The ambitious trade agreement was put on hold not long after Mr Trump officially took office in early 2017. Dennis Snower, president of the Kiel World Economy Institute, said: “TTIP light would be much better than a looming trade war and better than the status quo." Gabriel Felbermayr, head of the Centre for Foreign Trade at the Munich Ifo Institute, stressed: “In fact, a free trade agreement with the US could be part of a solution,"
Andreas Freytag, economics professor at the Friedrich Schiller University Jena, thought it would be preferable to offer Mr Trump a negotiated solution than to ask for leniency for the EU. He explained: "In that sense, TTIP light would be a real step, especially since tariff reductions in this country would benefit us. "It’s also an improvement over the status quo, because such an agreement not only keeps transatlantic relations alive, but creates a positive momentum, which can be crucial in the long-term post-Trump period." Michael Hüther, director of the Cologne Institute for Economic Research said: "This way Trump’s critique is translated into a mutual treaty solution. This is how we come back to rule-based and WTO-compliant procedures." Nevertheless the obstacles to TTIP-light are considerable, with no guarantee of EU member states agreeing to the idea. Meanwhile, Eric Schweizer, President of the Association of German Chambers of Industry and Commerce (DIHK), said that "any special deals are not in the interest of German companies". Mrs Merkel called Mr Macron and British Prime Minister Theresa May after returning from Washington this weekend, with government spokesman Steffen Seibert saying, all three had agreed that the EU was ready "to defend its interests in the multilateral trade order".